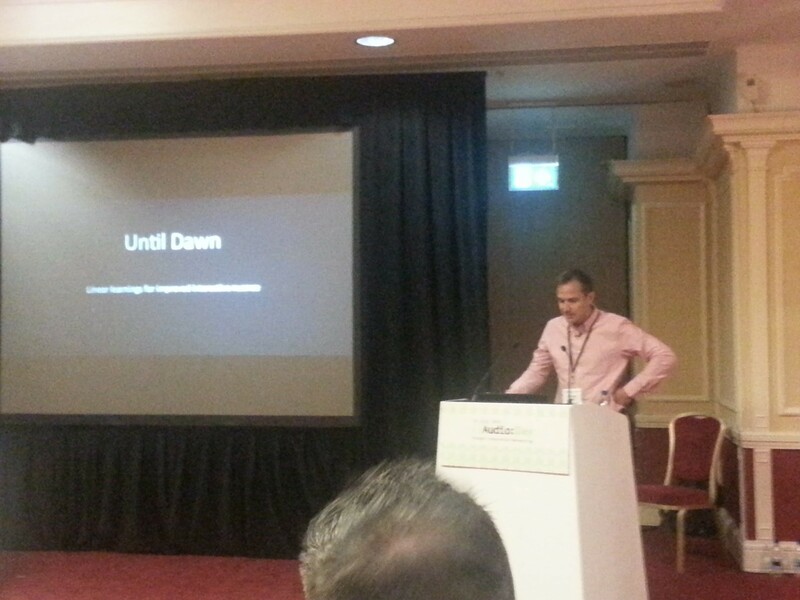 Sam & Alex recount their time at this year’s Develop in Brighton conference last week. The Develop 3-day conference in Brighton hosts a wide variety of talks from professionals all over the games industry. Thursday is the day for the audio track and the day we are most interested in. We had talks from some of the industries best known game audio professionals including Barney Pratt, Chris Sweetman and Lydia Andrew. The whole audio track is put together by John Broomhall, who is not only a fantastic composer, but a leading figure in bringing great game audio content to the forefront. Tuesday featured mostly talks about funding for indie studios and the pitfalls of developing for VR and AR, while Wednesday saw the many disciplines of game design and the opening of the expo. Jory Prum Beep webisode interview, voice & sound session from Ehtonal on Vimeo. It was highly emotional, but warming to see Jory in his element discussing different whistles and animal calls in his bag of tricks. It is still a hit to the audio community and it was great to have a glimpse of the man in action. The first talk of the day was an in-depth discussion of Until Dawn, by Barney Pratt, Audio Director at Supermassive Games. It was great to see how different elements were used throughout Until Dawn to constantly lead the player into certain emotions and reactions. He showed us a small section of logic flow, depicting both determinate and variable assets, due to the branching nature of the narrative. Events would lead to multiple other subsequent events, with 3 or 4 options leading to a very complex flow. Interestingly, due to the nature of the game, Barney explained how they took a very filmic approach to the audio. What was particularly interesting, was their solution of dialogue panning to work with the medium. Barney discussed how they tried the standard (or as Barney put it, “safe”) panning technique for film, panned centre. However this didn’t work and removed the player from the immersion throughout the scenes. They also tried full 360 location panning, so that the character dialogue would originate from where the characters were situated. This also had issues, as the cuts to different camera positions produced a jarring effect. The solution they came up with was coined “50% centre bias panning”. A lot was mentioned about the use of Jason Graves’ music, and how grateful Barney was for Jason’s collaboration and trust with his stems. Jason provided a wide amount of stems (up to 20 stems for each cue!) for Barney and the team to rearrange as needed during the game. The subtle techniques that were used definitely enhance the horror aspect of the game. One of the simplest techniques, included the varied use of a gliss building to a stinger. Building patterns, but then subverting player expectations, was key to staying one step ahead of the player, leading to a more engaging and unpredictable horror experience. This was swiftly followed by a VR panel consisting of Barney Pratt again, for his work on the Playstation VR title, Until Dawn: Rush of Blood, Matt Simmonds of nDreams and freelancer Todd Baker, known for Land’s End. A lot of “lessons-learned” were shared, as with the VR medium, a lot of people are learning how to work with it on projects as they go. One of the key things that seemed to be agreed on was 2D ambiences, and how that should have been the focus from the beginning. Some points were made, that may sound obvious but are good to remember. Such as, not forcing the player to feel a certain way. Leave things out like breaths, heartbeat etc. as they will be felt by the player and if you leave them in you’re trying to force an emotion on them. However, it is still good to keep in the environmental factors suich as footsteps and Foley, of the player interacting with the environment. It’s nice to have a reminder that with VR experiences, it is no longer just the character, but it is the player themselves interacting with the game world. It was also nice to hear how Barney had used his aural experiences while cycling, to influence the use of air turbulence in Rush of Blood, altering in timbre and frequency content based on the head movement of the player. He also mentioned how you can use the personal space of the player aurally and use the proximity of audio to affect them. The Rush of Blood example used, was when the maniac comes right up to the player and speaks really close to them, to mess with the player’s emotional state and experience. A key point made by Todd, that everyone agreed with, is how important it is to leave the headroom for the use of these techniques, giving yourself breathing room to work and play with. 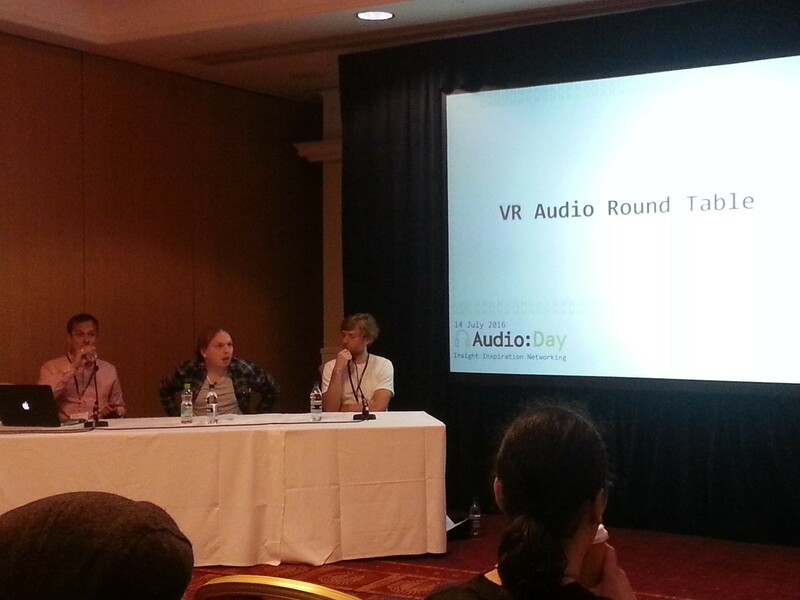 Another struggle they mentioned, which seems to be common of VR in general at the moment, is how to utilise music. The diegesis of the music is more important than ever now. Whereas before, when watching on a screen, we could accept that the non-diegetic music was not part of the world. Now it seems almost bizarre when music is used in a VR experience, as if we’re constantly listening to music while in the experience. The panel discussed how they varied between diegetic and non-diegetic placement of the music, changing between when necessary. They also discussed how non-diegetic music was rarely used, as it can break the immersion. Finally, they stated how important it is to mix while listening to the environment, which was an interesting idea. Barney even raised the point that sometimes they have a two-person mix process, with one playing while the other mixes. A very interesting way to work, which surely both solves problems while introducing others? We were lucky enough to then take a look behind the scenes for the game Quantum Break. The game had two contrasting worlds, the “real world” and when time was frozen, in a phenomenon named a “Stutter” within the game. For every sound effect and piece of music created for the real world, a contrasting partner was created for time spent within a stutter. It was really fascinating to see how the audio team worked to create the trademark sound for the stutter world. Originally they had the issue of it sounding too much like underwater, so developed a technique they call “Rapid Protoyping” where each team member has to create a piece of sound design starting from scratch in 30 minutes. The team then voted on their favourites and the winner served as a benchmark for all future work. The end result is a fantastic showcase of matching a games mechanics with the audio. Working freelance can be a struggle, as many of us who work in game audio, know full well, so we’ve collected some helpful pieces of advice from the panelists (Chris Sweetman, Rebecca Parnell, Todd Baker and Mark Estdale). Chris Sweetman said “Don’t go straight out of university into freelance work”. All the panelists had started off in-house before taking the plunge into freelance. It was also mentioned that it’s very important to stay on top of your finances, and consider hiring an accountant. With regards to home setups, Pro Tools was the DAW of choice, with Todd Baker working entirely from a laptop! Chris: “It’s a myth that you have to spend ridiculous amounts of money to create quality audio…Creativity is more important”. When it comes to breaking into the industry and finding work, all panelists agreed that word of mouth/recommendations is most important but that it’s also harder for people to get into the industry these days. Todd Baker said it was important to have a website and market it towards a certain kind of project. Rebecca Parnell closed with how important it is to maintain good mental health and learn to take breaks when stuck in the studio for long hours. Moving on to the incredible audio of Assassin’s Creed: Syndicate, with Lydia Andrew. Each Borough of London has a distinct sonic identity that the audio team worked hard to define and shape through the use of music, sound design and even the accents and conversation topics of groups of people. The twins Evie and Jacob features different instrumentation, depending on who the player is using. If you’ve played far enough into the game, you will have come across the Murder Ballads, written by Austin Wintory and Tripod. These songs are also influenced by their location within the game, but are also referenced in the music for the Boroughs. There’s so much detail to the game, it really does set a gold standard for game audio. Next we had a talk on getting the best from voice actors given by Mark Estdale. He likens the skills of a voice actor, to that of a spy. Estdale then goes on to say the most powerful thing you can give your voice actor is an image of the character, but not to let them “brew” information for too long, since you want their audition to be authentic and as “on the spot” as possible. Then everyones best loved franchise: Star Wars. The team at EA DICE did a stellar job of modernising many sound design aspects from the original Star Wars movies, while still retaining everything we love about the audio. They had a lot of work to do in making the sounds work in a dynamic environment, and ended up rebuilding alot of original sound effects to sound as similar as possible but still with their own twist, and more importantly, the ability work in-game. All the reverse engineering was totally worth it, with Star Wars: Battlefront being regarded as having a fantastic sound. Lastly we had an open mic session, where the speakers were invited back to address questions that the audience had from throughout the day. The biggest topic of the evening was how to charge as a game audio professional. Todd Baker said that flexibility was the most important thing. Also that it was importnat to consider, for example if you are working for £200 a day, it is heavily impacted by factors such as your work rate, sick days, adding to your pension, and of course the length of your contract, so it’s not as simple as that being your salary. Often longer contracts should equate to better value for the person hiring, and it’s always good to implement a “sliding scale” model. It was generally regarded that if you were a sound designer with 5-6 years experience in the industry, you should be expecting about £250-350 a day. Rebecca Parnell added that although this may sound like a lot, once you have taken all the other day to day factors into consideration, it’s a low rate in comparison to other professions in game development, such as programmers. Kenny Young then went on to say that there is a lack of “Darwinian pressure” and that many developers are settling with 7/10 audio, and that many game developers simply aren’t experienced in working with audio professionals. Lydia Andrew thinks this may be because of a worry of using the wrong language or seeming like they don’t understand our profession, when it’s perfectly ok for developers to describe their vision and it’s up to us to interpret that in the best way possible. John Broomhall wanted to call for some transparency, or standard of rates to make it easier for those working in audio to price themselves appropriately. The closing piece of advice, came from Joe Henson: “Don’t be a pain in the arse”. So there we have it, another year of Develop conference over. An amazing time was had by all of us, and we are keen to know what you most enjoyed over the 3 days, and what are your audio highlights, if you had any favourite moments? We hope you enjoyed Sam & Alyx’s review, check out others in our Reviews section :). Don’t forget to sign up to our Monthly Newsletter to make sure you don’t miss out on our reviews and interviews. We’re also running a Patreon campaign to make sure we can keep bringing you regular, high quality content if you’re feeling generous! Thanks for even sharing :)! A Composer for Video Games and Head Writer for The Sound Architect, I particularly love indie games and the emotional experiences games can bring, that stay with you for a lifetime. For me the soundtrack is the biggest part of this, and that's why I do what I do!